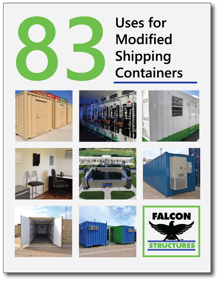 When someone asks a Falcon Structures employee what kind of shipping container modifications we do, it can be hard to know where to start. Should I talk about our own container-based office? What about the shipping container-based bathroom? Or wait! We just finished making a reconfigurable emergency response training structure! Whenever a sturdy yet mobile structure is required, modified shipping containers just make sense. It can be hard to pack all of the potential of shipping containers into just one description. To help get a sense of the possibilities, we’ve created the guide, “83 Uses for Modified Shipping Containers.” The truth is, there are many more than 83 uses, but this should get you started. We think uses 23, 41, and 73 are particularly creative!